by Syed Haider Raza Mehdi. As Operation Zarb – e –Azb, gets under way, it is time to briefly reflect on why the operation may be the best option, albeit about 3 months late. But with all its negative serious, tragic and often horrific consequences of an urban nationwide devastation, and the many innocent loss of life and property in the “operational zones, who will suffer the “hot winds” of terrorist actions, it is essential that this now must be militarily fought to its bitter and painful end. What is even more important is the “re-building” of the ravaged land of its physical, human, and emotional devastation and consequences. In this the role of post war, rehabilitation is CRUCIAL. Otherwise, like the circular debt, it will raise its hydra heads with even more viciousness and devastation. And unfortunately the current Federal Government is the worst possible one could have imagined to do this. So while we sincerely pray that the operation will succeed, we must think and plan for the post operation phase and have a governance entity which can do the needful. Tough times need tough decisions. The NS government cannot do it .Period. 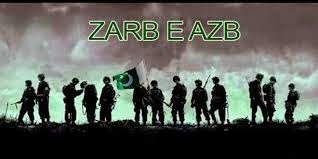 So why is Operation Zarb-Azb, crucial and essential to give us a fighting chance of future peace? Firstly, the TTP wanted breathing space to consolidate their forces, recover from the degradation of their power, because of the army operations these last two years. And remember we are specifically talking of the TTP and its Al Qaeda affiliates and those who propagate the ISIL and ISIS philosophy and NOT the people of FATA at large. This resulted in a significant loss of the TTPs ability to launch any operation against the Army as they had been doing from 2007 to 2013. But because they were beaten and pushed into North Waziristan, they are now unhinged and on the back foot. However they can and will still create havoc by bombing civilian soft targets in urban cities of Pakistan. The TTP is our main enemy. The TTP have very cleverly developed a narrative which weaves Islam, Pakhtunwali, liberation of Afghanistan, anti US resistance, an Islamic Caliphate, Sharia, and God Knows where they get their version of the Sharia, anti Shiasm, and of course loot plunder, money and power into one narrative and attracted various criminal elements into their fold. So they also wanted their people freed from jails, they wanted the summer months to pass without a military operation, because it is difficult to conduct military operations in the winter, and lastly they did not want an operation till the bulk of the US troop departed from Afghanistan, so they had large force into a free run into Afghanistan. In a nutshell they used the “talks” presence”, to recover from their wounds and consolidate their power. Once they would have been ready, they would have renounced the talks under one pretense or the other and then wreak such terrible havoc and hell all over Pakistan, as they started to do with the Karachi airport attack. And these will now most likely increase. Their agenda is simple, destabilize the state of Pakistan, as their partners are doing in other Muslim countries, such as Syria and Iraq, weaken these countries, grab territory and impose their terrible and horrible version of our pure faith. In this they are playing right into the hands of the enemies of Pakistan who fund them through several faces removed. Lets be clear on one core objective that fuels the anxiety the world over. Everybody in the world except Pakistan would love to see a “de-nuked” and a weak and, God Forbid, the worst case broken up Pakistan,. So here we have it as clear as it can be. While many had hoped, perhaps some in genuine naivety that the talks would end in a genuine peace time has proved that it hasn’t and will never for the reasons cited above. So fight we must !! Hence the view that Operation Zarb-e-Azb is the only answer, amongst the very limited choices we have and had, and now. .
Today a large part of their “foreign fighters” have left for Syria and Iraq. Also for the time being their sources of funding have been significantly reduced as their “financiers” are now financing ISIL/ISIS in Syrian and Iraq. Hence their resort to kidnapping for ransom to fund their activities, has risen manifold. This last coupled with the “power struggle” within the TTP, has brought about the split which we see today. So we have to fight them, and sooner than later. So those who still want talks. Take your pick. Now or later. Otherwise Peshawar, then Nowshera and then Islamabad and so on is on the cards..
And the real difficult question is whether even this military option will work or not? The jury is out. But clearly a better chance now for success, than later when these enemies of Pakistan would become even stronger. Yesterday’s Karachi Airport attack, the slaughter of innocent people in the sectarian madness which has gripped Pakistan, as in Quetta yesterday, the horrifying beheading of soldiers by the TTP, the fratricidal bloodbaths in Syria and Iraq,. What is going on? And why? Here’s a perspective. It starts with the fossilization and complete absence of any form of creative reflective thought in the Muslim world. And I deliberately use the phrase Muslim world and not Islamic world, for they represent two very different perspectives. The former is the perspective adopted by Muslims, very dogmatic, entrenched and narrow, while the latter would be, a perspective based on rationale, logic and laws, which represent evolved thinking, societal development, scientific and technological discoveries ( not “Islamic” science and discoveries). I say not Islamic discoveries, for the entire nature of the Universe and Creation, for a believer in ‘Creationism” as we Muslims are, is the Work of the One Supreme Creator. He Existed Before Everything and After Everything. Quantum Physics proves the Universality of “energy” as the only source of everything. Since then the Muslim World has failed to re-interpret and redefine their code of conduct based on very different individual, societal, scientific, technological developments and challenges. The 5 theologians were certainly great, eminent and well versed theologians, perhaps the leading scholars of the Quran, Hadith, Jurisprudence, Shariah etc, of their times, but we must not forget that they lived several hundred years ago, were not God Ordained Prophets and were only able to do what they did, as best as they could, based on their personal abilities, readings, research, understanding and their views of what the Shariah Code should be for a society which existed in their times. This is like using the scientific and technological formulas and knowledge of the 11th and 12th century scholars of medicine, science, astronomy, physics, chemistry, mathematics etc, in fact every aspect of life( all God’s Rules) to develop things for today’s needs. For the Muslim world, to become truly “Islamic” which means being a humane, gentle, inclusive, fair, tolerant faith, accepting the right of people to hold divergent and contrarian views and beliefs, as most powerfully and symbolically manifested in the Holy Prophet’s (PBUH) Charter of Medina, must re-vitalize its strongest value, which gave its greatest strength, that of reflection, discussion, discourse, to find answers which today challenge the minds of 21st Century Muslims and Non-Muslims. And a process which must continue to develop practical solutions, based on the eternal principles of Islam, which allows people to practice a faith in new and evolved environments, as society changes and morphs. The Muslim society, as History proves, reached its earlier zenith and height, not because it was dogmatic, but dynamic, not exclusivist, but inclusivist, not fossilized and frozen, but phenomenally fresh and continuously challenging and coming up with answers and solutions for that day and age. It certainly did not have a “my way or the highway” message for non-believers, or those of different sects or faiths but “I will fight to defend your highway”. Unfortunately, the continuous downfall of Muslim societies and this great liberating faith, can be traced to the era of exclusivistic dogmatism following the interpretation by the five Imams, when it became a “sin” to challenge existing dogma, even as times and centuries passed. Unfortunately, this dogmatism has become even more tragically entrenched today. Today Muslim Countries, collectively represent the worst forms and examples of terrible, cruel and corrupt governance. We see the unending exploitation of the weak and the poor, unbelievable poverty, non-existent health care, education, and job opportunities, discrimination of every sort, zero scientific and technological development, except for farces like the “water car” in Pakistan and other such nonsense. We must reflect, deeply, dispassionately and objectively that something must be terribly terribly wrong in the manner in which we interpret and practice our great Faith with the result that today, we are at the bottom of pile. Our current state, certainly does not reflect the Great Teachings of the Quran and The “True Way: and “Sunnah” of the Prophet” PBUH. We must learn to live in a world of divergent views and beliefs within and outside the pale of Islam. This is the true message of an enlightened Islam and an enlightened polity. We must reflect, challenge and come up with answers for today. We must not blindly follow centuries old interpretations, by people who did the best that they could, given what they knew then and what they saw then. We must reflect, discuss, discourse, research, re-interpret and manifest codes which reflect our current states based on the Eternal principles as laid Down By The Creator. For those who support Mir Shakil, GEO and Hamid Mir, Ansar Abbasi and the likes, here’s my viewpoint. As children when someone was loosing at Ludo, they would deliberately and cunningly up end the board and the gotis so it was difficult to put the pieces back together, restart the game and get back to the real issues. Mir Shakil of GEO has up ended the board so the real issue is lost. Standing up for GEO is not about Freedom of speech, as he and supporters of GEO and Hamid Mir would love to make it out. Or about the heavy handedness of the “agencies”. The organisation, and really its Mir Shakil ur Rehman, if one were to seek cause, who has played a terribly dangerous game under this garb of freedom and have caused immense harm to Pakistan. But if GEO allows them their forum to insidiously brainwash people then i have a serious problem. And if it means their covert and active support of such enemies of the Country then I have a problem. If it means selective misreporting as on Balochistan, then I have a problem. If it means causing the deaths of people ( Col. Imam and Commander Khalil) then I have a problem. The media in Pakistan which is supporting GEO is subjective and stinks of “Asabiyah” and in this case completely wrong. I have always stood up for the underdog, For those who dont my background ( not very impressive) . Resigned my commission as a Captain against Zia’s Martial law in 1981, walked out of the hall when he started speaking as a Chief Guest in an APNS ( All Pakistan Newspaper Society) function in Karachi, where he was fawned over by all these media luminaries.Refused to work undercover for my former comrades in arms. Actively worked with Air Marshal Asghar Khan and TI against Zias Martial Law. Wrote a wide ranging very biting commentary on Gen Musharraf rule in 2007. More about how he lost perhaps the best opportunity someone had to turn this country around and how his heavy handedness in his last days was causing more harm then good. So I am no apologist for military adventurism. But GEO, which means Mir Shakil and his very suspect objectives, the likes of 5th columnists like Hamid Mir, Ansar Abbasi et al who are enemies of the state must be stopped. This is because Mir Shakil will not stop his tirade against the Pakistan Army and the ISI. Why he is doing it is an enigma. But he will not stop. And Nawaz Sharif will also let him do so, for it serves his purpose of a weak Pakistan Army and a weak ISI. So If we dont stop this now, time will prove me right and woe betide that day. Hazara! Lambs to the slaughter and Imran’s Shame! A short note on the CJ LHC reprieve to Hamza! Rass Aziz on PM visits the GHQ. A Short note! Briglatif on PM visits the GHQ. A Short note! Mir Muhammad Farooq Meyer on PM visits the GHQ. A Short note! Zahoor Akbar Malhi on PM visits the GHQ. A Short note! Akram Anjum on Husain Haqqani and his latest piece on Nawaz’s disqualification in the Indian Newspaper, The Hindu!